What kind of education would you have received if you had lived in a different time? Interesting to think about. Give your child the gift of great grades. Order a copy of The Secrets of Top Students today! What are some of your favorite scholarships? Bull’s Head, Heraklion Archaeological Museum. The Minoans revered the bull. I bring this up because I just found these amazing videos in youtube, in which young men and women in Spain do the exact same thing! If there’s any doubt as to whether bull leaping is physically possible, these videos will clear it right up. It’s incredible that this ritual has survived for thousands of years. My article on the Dura Europos synagogue has been published by Shofar: An Interdisciplinary Journal of Jewish Studies. Dura Europos was an ancient Roman city in modern-day Syria, destroyed by the Sassanians in the third century CE. It contained many houses of worship, including a synagogue that was covered in paintings of biblical scenes. These wall paintings are now in a museum in Damascus. My article is about the inclusion of scenes of violence and warfare in the synagogue paintings. Dura Europos was the site of a Roman garrison and was located between two warring empires, so the Jews who lived there were probably familiar with such sights. Some of them may even have served in the army. 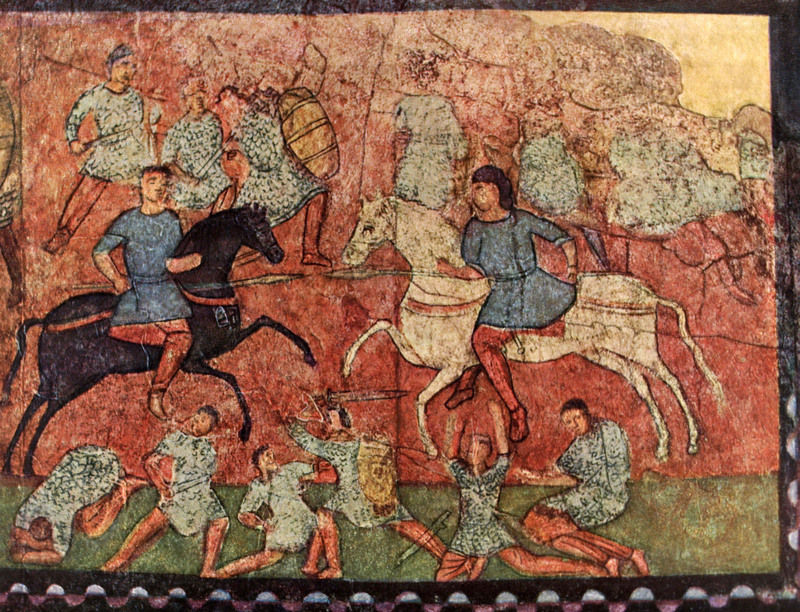 Take a look at this bloody scene, the Battle of Eben-Ezer, from the Dura Europos synagogue. One issue regarding the wall paintings that has received little attention, however, is if and how the militarism of Dura-Europos influenced their iconography. Ben Zion Rosenfeld and Rivka Potchebutzky have examined the relationship between the Jewish community and the military garrison at Dura, but they are largely silent on the subject of art in the synagogue. In the surviving paintings, there is only one panel that clearly depicts a scene of war: that of the Battle of Eben-Ezer, described in Book I of Samuel. However, there are numerous images that refer to warfare indirectly, such as those showing men in armor, acts of violence, and scenes of carnage and destruction. The prevalence of such imagery could signify the Durene Jews’ awareness of the danger of living on the border between two powerful empires. They may have witnessed real-life carnage and likely heard tales of battles that took place close to home. They lived in close proximity to the garrison and probably saw soldiers on a daily basis. It is also possible that some of the Jews living in Dura were active participants in the Roman army. Scholars accept that other temples in the city, such as the mithraeum and the Temple of Bel, served the spiritual needs of Roman soldiers. But they rarely ask whether the synagogue could have served a similar purpose. Want to improve your grades? Order your copy of The Secrets of Top Students today!